Seville is one of the most emblematic Spanish temperament cities, but also Seville has given the world one of the most remarkable temples, namely the Seville Cathedral. The official name of the Seville cathedral is Catedral de Santa María de la Sede. It is remarkable for its enormous size, and today is considered the largest Gothic church in Europe. The beautiful Santa María de la Sede is included in the UNESCO list of World Heritage sites in 1987. Currently, Seville Cathedral is considered the third largest church in the world after St. Peter in Rome and St. Paul in London. Santa María de la Sede was completed in the 16th century, at the time it takes the title from Hagia Sophia, in Istanbul, which for more than 100 years had the title of the largest temple. Seville Cathedral is famous because in it lie the remains of the famous Christopher Columbus. Englishmen and Italians to this day try to take the title of the cathedral of Santa María de la Sede as the biggest temple, but this proved impossible. Seville Cathedral has the record size of its base. Santa María de la Sede was built in less than a century, as a demonstration of wealth and prosperity of the city that around the 15th century became an important commercial center. The foundations of the temple were laid in 1402 at the site of a previous mosque, which was badly damaged during the earthquake of 1356. The city, which discussed the rise of the temple, took definite decision: "Let the cathedral be so beautiful and great that everyone who sees it thinks we are crazy". The main idea was for Seville Cathedral Santa María de la Sede to be unlike any other and be unique. Finally the temple was completed in 1520. Five years after it had completed construction, the dome of the church collapsed and work on it began again. The dome collapsed again in 1888 and restoration works continued at least until 1903. The incident in 1888 was due to the earthquake that destroys absolutely all religious valuables that are underneath. The belfry of the Seville Cathedral Santa María de la Sede is named Hiralda and today it is considered the symbol of all Seville. The belfry was built on the ruins of the collapsed minaret of the mosque, which was the work of Yakub al-Mansur, in 1196. Then its height is reached 82 meters and a 32-meter tower upgrade in Seville cathedral was added in 1568. The final dome reached a height of 114 meters, which is remarkable for its rich decorations and ornaments. In the bell tower of Seville Cathedral are 22 harmonically tuned bells. In the interior of the Seville Cathedral Santa María de la Sede one is a little startled by the dark and rough interior, however, has preserved some of the greatest works of art. Among the precious relics and treasures of the temple are paintings of Murillo, Diego Velazquez, Francisco de Goya and even Surbaran. They say that the cross of the cathedral is made of the first gold that Columbus brought from America. In the Seville Cathedral is located the grave of the famous sailor. In fact, his body was probably buried in the capital of the Dominican Republic - Santo Domingo. The lead tomb of Columbus in 1544 was transported from Seville into the cathedral of Santo Domingo. It is estimated that in 1795 his remains were moved to Havana, a hundred years later were again returned to Seville. Today, anyone who wishes to see Seville Cathedral and is a foreigner must pay an entrance fee of about € 7.50. 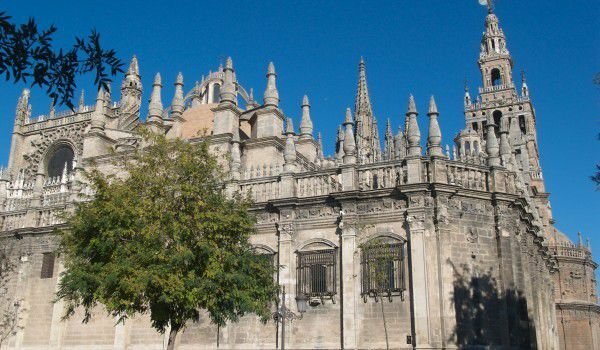 For the citizens of Seville access to Cathedral Santa María de la Sede is always free, and on Sundays entrance is free for all.